In yet another example of why you shouldn’t text and drive, a Texas college student drove off a cliff while texting. Fortunately, he survived, but incurred some serious injuries. After six months of recovering, he’s finally able to talk about it. This guest post is from the Pentlarge Law Group, of Anchorage, Alaska. Road accidents are commonplace in the United States and the constant technological advancements have proven to be insufficient in reducing the death toll over the years. If you too have been involved in an accident, it’s important to hire a car accident attorney to assist you with recovering compensation and reduce the substantial amount of paperwork, and stress related to insurance claims. Knowing when to get in touch with an expert can make the difference between success and failure. Lawyers who deal with car accidents cover a variety of cases pertaining to personal injury, property destruction, wrongful death, and liability. When you look for an accident lawyer in Anchorage, for example, you must make your decision based on factors such as experience, commitment, skill level, fee structure, and location. For instance, the attorney must be well versed in national and state transportation laws, should know how to handle health and insurance care companies, and must know how to settle and prepare for a case effectively. Apart from this, it is also essential that you check the background and track record of the lawyer. When Should You Contact an Accident Lawyer? It is advisable to get in touch with a lawyer as early as possible to avoid any mistakes. The deadline to file personal injury claims differs from state to state. As you will need to cover lost wages and pay medical bills, the sooner you hire a legal expert the better. Generally, a person must contact an attorney within couple of weeks after the accident takes place. Also, never reach a settlement with an insurance company without a lawyer supporting you. Before talking to a lawyer, gather as much information and facts about the injuries, financial losses, and accident as possible. Details should be shared with your attorney after an accident including the information exchanged at the accident scene, your insurance policy, medical records, and the like. It is wise to consult a reputable car accidents attorney Alaska or firm in your area that can represent your case and help you get full compensation. One of the firms in Alaska that offers such services is Pentlarge Law Group. The attorneys have the expertise and knowledge to handle the most complicated cases. They can be contacted at (907) 276 1919 or http://www.pentlargelaw.com. When I read Bob’s post on new safety standards for urban transit systems, I thought – well, great! Finally, some sort of federal regulation will exist to enforce the most basic safety oversight. In a nation as large and developed as ours it’s amazing that there are no official safety guidelines in place. It took a tragic accident that killed 9 people on a Metro line to finally push for a safety bill. I even started thinking about how some day we might have seat belts on a train – after all cars have them, so why shouldn’t trains? It didn’t quite click in my mind that my way of thinking about this issue was completely wrong. Later that evening, on my commute home I tuned in to a radio station that was running a program on how the Bus Riders Union is planning to protest cutbacks of over a million hours of bus services in L.A. Listening to the program made me stop and think – if the government is willing to throw (insufficient) funds at safety programs for railroads, why wouldn’t it just restore service for buses instead? After all, thousands of people rely on bus services who otherwise have no access to trains. Minimum crashworthiness standards? Why wouldn’t we focus on eliminating crashes entirely? If we look at the history of train accidents in the United States, most if not all were caused by human error. Here I am thinking about which seat is the safest on a train and contemplating seatbelt use while completely ignoring the obvious – eliminate the issue of train crashes entirely. Why dedicate funds to establish “better evacuation and rescue plans” instead of focusing on completely eradicating the safety problem? During several trips to Japan I couldn’t help but marvel at their transportation system, how efficient, punctual and safe the trains ran. Any country in the world would be envious to have a similar safety record as that of the Japanese rail system. Sure they’ve had a few snags along the way but if we compared the number of hours to the number of accidents – the record is nearly immaculate. It turns out the Japanese rail system uses an automated safety mechanism known as Positive Train Control (PTC) – a GPS based system that allows for automatic monitoring and reaction to railway, weather and traffic conditions. According to gps.gov, “A PTC system can automatically vary train speeds, re-route traffic, and safely direct maintenance crews onto and off tracks.” It also turns out United States has a federal mandate to make commuter railroads implement this system by 2015! Reading about the PTC system plan lead me conclude that safety bills should instead direct the funds to bus system development or at the very last resort to accelerate the implementation of the GPS-based system (to avoid passing the cost to the passengers.) I would personally complain about the cost of some rail passes as I purchase them month to month, but after hearing about the bus issues I would rather see the government direct funds to maintaining and expanding the bus fleet around the populous cities in the United States. With the ever-increasing urbanization of our cities as the world population grows, it will be important for our country to bring our infrastructure up to date. Even though trains are useful to the masses of suburbs, we can’t ignore the fact that it is impossible to connect all of the cities with rail systems alone. Buses can and already have been solving our commuting problems for years and should be expanded heavily, or at the very least maintained. Lastly, this morning I took my own advice and sat in my “preferred” seat only to feel awkwardly uncomfortable and moving to another front-facing seat with plenty of leg room. There is no doubt I would bounce around like a lottery ball in an event of an accident, but let’s face it – there are bigger problems to worry about, AND not to mention the Positive Train Control system is coming to my line sometime next year! WUSA-TV Washington reports on its website, "After a horrific Metro Red Line tragedy in 2009 that killed nine people and injured 76, Maryland's Congressional delegation led the way in pushing for reform, insisting on national safety standards." Up "until now, there was not a single federal safety regulation for Metro trains or any other passenger train nationwide." Peter Rogoff, Administrator of the Federal Transit Administration, commented, "Since 1964, there has been a gaping loophole in transit safety oversight." In addition, NTSB Chairman Deborah Hersman commented, "The legislators have done what they needed to do-give the authority to establish these safety standards. It's now up to Metro, the operators and the regulators to make sure that that promise is fulfilled." NEWS 8-TV Washington, DC reports, "For the first time, there are federal safety standards for subway systems like Metro." Congress "has passed and the president signed off on the new federal transportation safety bill." The NTSB "is recommending requirements like better evacuation and rescue routes, black box data recorders, and limits on the number of hours train operators can be on the job." The AP reports, "Lawmakers and transportation officials gathered Monday to discuss the new law, which mandates the establishment of federal safety standards for subway, bus, light rail and streetcar systems." Deputy Transportation Secretary John Porcari said, "This will mean lives saved." The NTSB is assisting in the development of safety standards, and "among other things, the NTSB will push for minimum crashworthiness standards for subway cars, a requirement that subways carry data recorders and limits on the number of hours that train conductors can work." Rogoff said "the government would not take the step to withhold grant funding lightly because transit agencies need money to make systems safer." WAMU-FM, DC reports on its website, "The proposed standards, which will include guidelines for crashworthiness and improved evacuation measures in case of an emergency, will also include recommendations made by the NTSB." Officials say "regulations could take up to a year to establish." The Gaithersburg (MD) Gazette reports, "Congressional and federal transportation officials staged a news conference Monday at Metro's training center to tout the first-ever national safety standards for transit systems, even as Metro wrestles with ongoing safety concerns." The conference had been "scheduled before the weekend's software glitch, in which personnel lost track of two trains, and dozens of trains had to idle in stations." The incident "follows the recent mishaps in which a subway car's doors opened in route and a heat-related kink in the track caused a derailment." With the summer lull at Dallas-area schools, managers of the bus system are focused on a multimillion-dollar seat belt safety campaign. Thanks to state aid and local funding, they expect that seat belts will be in half of their fleet of 1,695 buses by the time students return to classes. It’s the latest safety effort by Dallas County Schools, which carries 65,000 students in 11 districts, and has generated praise from children’s advocates. Since 2010, the state has required all districts that receive state funds to have three-point, lap-shoulder seat belts on their new school buses. Also, the Texas Education Agency helped allocate $2 million to districts to help pay for installing belts in existing buses. Dallas County Schools received $250,000, more than any other in the state. “Our board looked at it and decided that it was important enough for the safety of our children that we go ahead and start budgeting to fund retrofitting buses and … that anytime we purchased buses in the future that they would have the three-point belts,” Dallas County Schools Superintendent Rick Sorrells said. The board had begun retrofitting around the time the Legislature was considering the seal belt requirement. The fleet now has 598 of its buses equipped with seat belts and expects another 300 to be equipped through retrofitting and new purchases by the end of the summer, board president Larry Duncan said. Sorrells estimated that all of the district’s buses will have three-point seat belts in place over the next two years. The Detroit News reports that, according to a study conducted by the Insurance Institute for Highway Safety, "advanced auto technologies" like forward-collision avoidance systems, adaptive headlights, and technology that allows cars to brake automatically, "result in sharp drops in car crashes." The Detroit News adds that the "study by the industry-funded group also found that lane-departure warning systems appear to hurt, rather than help -- though it's not clear why. Other systems, such as blind-spot detection and park assist, aren't showing clear impacts on crash patterns yet." Bloomberg News reports that the National Highway Traffic Safety Administration said yesterday that they have "been studying forward-collision warning and autonomous braking systems since 2010." NHTSA Administrator David Strickland said that last year that "his top priority is preventing crashes. The agency has spent much of its first three decades trying to make cars safer." Also reporting this was ABC World News. The Detroit News reported that Toyota on Friday "expanded its 2009 recall of vehicles for pedal entrapment to include 154,000 model year 2010 RX 350 and RX 450h (hybrid) SUVs from its Lexus luxury line, the first new recall for the issue since early 2011. The automaker told National Highway Traffic Safety Administration that it is still seeking a fix for the Lexus vehicles." NHTSA said it was urging "consumers impacted by the recall to immediately remove the floor mat and have their vehicles serviced promptly." The Detroit Free Press noted that the National Highway Traffic Safety Administration "expects the remedy proposed by the company – which involves replacing the pedal and the mat and installing the override software – to take care of the problem." The Los Angeles Times says NHTSA regulators "warned the automaker that it might face another investigation as to whether the company 'met its obligation to notify the agency and conduct a recall in a timely manner.'" The Wall Street Journal added that NHTSA approached Toyota a month ago "after the agency observed an increase in consumer complaints and other reports regarding pedal entrapment in these vehicles." I admit I've always been a little nervous driving near 18-wheelers. I try to avoid staying next to one for any longer than absolutely necessary. My brain knows that big-rig drivers are generally excellent at their jobs, but my gut tells me to stay away from those trucks. Perhaps it's because of the number of clients I've had over the past 41 years who have been injured in big truck crashes. Or maybe I'm just a wimp. Who knows? Roughly one-third of the 3,446 truck drivers involved in fatal accidents in 2010 were cited in police accident reports for such contributing “driver-related factors” as speeding, fatigue and inattention, a senior federal transportation researcher said. The numbers show that truck drivers generally are good drivers and statistically safer than drivers of passenger vehicles, said Ralph Craft, a senior transportation researcher with the Federal Motor Carrier Safety Administration. By contrast, nearly two-thirds of passenger vehicle drivers involved in fatal crashes were cited for driver-related factors in police accident reports during 2010, Craft said. Federal large truck fatal accident data also shows that “vehicle-related factors” such as bad brakes, unsafe tires, or broken lights were cited only 4.2% for trucks, and 3.1% for passenger vehicle fatal crashes. There are a number of other contributing factors sometimes cited in fatal crashes, ranging from bad weather to obstructed driver views, but they are not broken out by researchers who study the roughly 100,000 accidents reported annually to the Fatality Analysis Reporting System, a large crash database maintained by the National Highway Traffic Safety Administration, Craft said. I've written several times about the benefits of rearview backup cameras in cars. They are great safety features, and highly recommended. Without a camera, drivers must turn and rely on what they can see out the rear window. Unfortunately, the driver can never see all the way down to the street level at the immediate rear of the vehicle. The "blind zone" is the distance between the vehicle itself and the spot where the driver can see the pavement. Naturally this varies from vehicle to vehicle. Every year, children are injured and killed because drivers (in 70% of cases, parents and relatives) don't see them while backing up. According to Kids and Cars, a nonprofit group that works to improve child safety around cars, at least 50 children are backed over every week in the U.S. Forty-eight are treated in hospital emergency rooms and at least 2 children die. A contributing factor is that larger vehicles (SUVs, pickups, and minivans), which have become increasingly popular, have larger blind zones than passenger cars. A blind zone is the area behind a vehicle that a person can't see from the driver's seat. To help consumers understand how large some blind zones are, Consumer Reports has measured the blind zones of a number of popular models. The results for both an average-height driver (5 feet 8 inches) and a shorter driver (5 feet 1 inch) are listed in the accompanying charts. Your best defense against backover accidents is to get out of your vehicle and check behind it just before you back up. If kids are nearby, make sure you can see them while backing up. 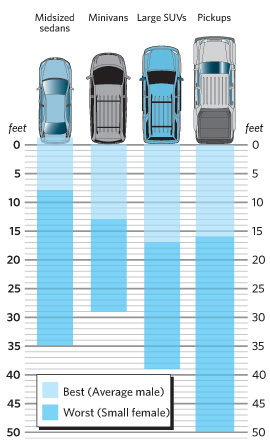 This chart shows the length of the blind zone of each listed vehicle. The distance noted is how far behind the vehicle a 28-inch traffic cone had to be before the person, sitting in the driver's seat, could see its top by looking through the rear window. Distances are provided for vehicles that are currently sold with no major changes from tested vehicle. "Best" does not include vehicles with cameras. "Worst" can include vehicles with cameras if the camera is optional. Plus, watch a video on how we test blind zones.